UNLV’s football team, which spent last Sunday celebrating an emotional Fremont Cannon win, gets to experience the other side of head coach Tony Sanchez’s 24-hour rule today. After rallying in dramatic fashion to force overtime on Nicolai Bornand’s 49-yard field goal, the Rebels had a field goal attempt blocked on their first possession and then couldn’t stop San Jose State star Tyler Ervin as the Spartans pulled out a hard-fought 33-27 Mountain West victory on Saturday night at Sam Boyd Stadium. The loss snapped a rare two-game win streak for the Rebels (2-4, 1-1) who now must turn around quickly to prepare for a Friday night nationally televised (ESPN2) game at sputtering Fresno State (1-5, 0-3), which was hammered at home by Utah State, 56-14, on Saturday night. “Unfortunate outcome,” Sanchez said. “I thought we did some good things. There are some things definitely to continue to improve on. Guys played hard, showed a lot of character. But this is one of those (games) where you feel like you got kicked in the gut a little bit. We are going to sulk about it for 24 hours and get right back to work on Fresno (Sunday) night. UNLV’s defense did a nice job of bottling up Ervin for three quarters. The 5-foot-10 senior, who entered the contest leading the Mountain West Conference and ranked second nationally in the FBS in both rushing (160.2) and all purpose yards (227.6), had just 21 yards rushing and 74 total yards entering the final quarter. But Ervin came up big down the stretch, rushing for 25 yards in overtime alone, including a game-winning two-yard touchdown run. Ervin’s winning score came four plays after Bornand, who had sent the game into overtime with a 49-yard field goal with 11 seconds remaining, had a 43-yard attempt blocked by junior defensive end Isaiah Irving on the opening possession of OT. Ervin, who finished with 73 yards on 18 carries and also caught eight passes for 74 yards and a TD, carried the ball four straight times for the Spartans (3-3, 2-1) on their overtime possession — the last one a stretching two-yarder off right tackle to win it. Junior quarterback Kenny Potter completed 30-of-48 passes for 329 yards and two touchdowns to lead San Jose State, which snapped a seven-game road losing streak dating back to a 27-20 loss at Wyoming on Oct. 18, 2014. UNLV sophomore quarterback Kurt Palandech, making his first college start in place of injured starter Blake Decker (shoulder), bounced back from a rough first half to throw for 217 yards and two touchdowns. He completed just 15-of-30 passes and threw two interceptions. San Jose State appeared to have won the game late in regulation when Potter hit Ervin with a 21-yard touchdown pass on a fourth-and-10 play with 1:08 remaining. But UNLV drove 43 yards in nine plays to tie it on Bornand’s 49-yard field goal with 11 seconds left. UNLV used a strong running game while building a 10-0 first-half lead and dominated action for most of the first 25 minutes, at one time holding a 163-30 edge in yards. But momentum swung in a big way when San Jose State sophomore safety Maurice McKnight picked off Palandech’s pass and returned it 54 yards to the Rebels’ 11-yard line. Potter then hit junior tight end Billy Freeman over the middle on the next play to tie it at 10-10. After a three-and-out by the Rebels, the Spartans came right back with a five-play, 75-yard drive, highlighted by a 42-yard pass from Potter to junior wide receiver Tyler Winston. After a fake to Ervin that drew the entire Rebels defense to him, Potter ran 20 yards untouched off left tackle to give San Jose State a 17-10 halftime lead. 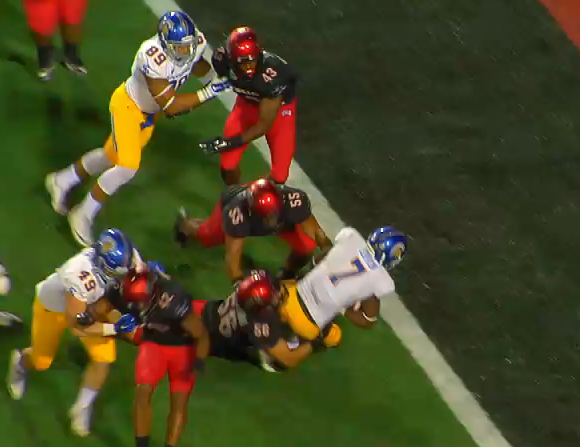 Austin Lopez’s second field goal of the game, a 34-yarder, increased San Jose State’s lead to 20-10 late in the third quarter, but Palandech connected on touchdown passes of 25 yards to junior tight end Andrew Price and 22 yards to Devonte Boyd to put UNLV back ahead, 24-20, with 3:41 left setting the stage for Ervin’s late heroics. “We aren’t being pushed around or walked over anymore,” Sanchez said.